My summer reading in 2018/19 included these two excellent titles. 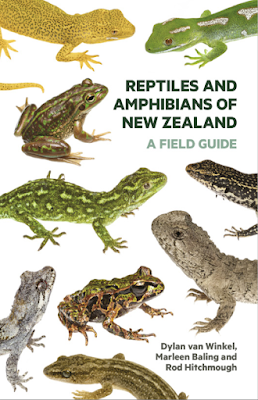 The first is the field guide of reptiles and amphibians that we’ve all been waiting for! The second is my new ‘go-to’ book about New Zealand birds. Followers of my nature blog will know that over the last five years I’ve been involved with several volunteer lizard projects. I’ve gone from only being able to tell the difference between a gecko and a skink to being able to identify particular skinks and geckos, such as a copper skink or a ngahere gecko. That hasn’t been an easy journey, but I’ve been lucky enough to work alongside some excellent herpetologists who’ve patiently explained the differences. My fellow volunteers and I have pored over some imperfect online guides and photos trying to spot the subtle differences between brown skinks and northern grass skinks, for example, subtle that is to a beginner’s eye. So it was with huge excitement that I opened the field guide. The guide is everything I hoped for. It’ll be an essential part of every restoration project’s kit bag, and for those of us working specifically with lizards a must have for the home library. The authors have thought of everything, from a quick guide on the inside covers to identification, through regional checklists, to keys for experts, making this a flexible and user-friendly guide. The photos are superb, each species is clearly described including useful detail about habitat, what the animal eats and whether, for example, it is diurnal or nocturnal. Importantly each species comes with a map showing where it is likely to be found, which will prevent many beginner’s mistaken identification. 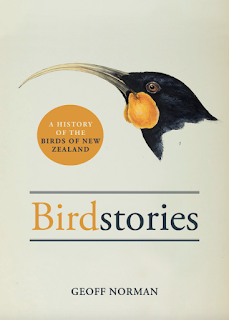 Rich in information, Birdstories, takes one group of birds at a time – there’s a chapter on kiwi, one on eagles and falcons, another on cuckoos and so on. Each chapter discusses the history of the bird(s) in question – both in terms of ancestry but also human interaction. You’ll find answers here on how it got its scientific name, whether it appears in whaktaukī, in some cases what aided its extinction, in others how it’s hanging on to survive. As such it’s perfect for dipping into and reading about one bird or group of birds a day. Certainly reading from cover to cover builds a picture of the place of our birds in the world’s biodiversity and of the human impact, but those that are daunted by the size of the book or who enjoy short bursts of reading will find it perfect for dipping in and reading one topic of interest at a time. A delightful aspect of Birdstories is the inclusion of early illustrations of the birds, as well as images of their appearance in modern day art or on everyday objects. Also of interest are the short essays interspersed among the chapters on related topics such as, a biography of Walter Buller, 19th Century illustration, legislation to protect birds, and so on. Birdstories is the book I’ll be directing all my fellow trampers and bird-appreciating friends to next time an intriguing bird question comes up. Several recent discussions come to mind – about the piopio (now extinct), cuckoos and which nests they choose, how the rifleman is a wren and so on – which would all have been answered by this book. Sadly few New Zealanders have heard of the piopio (now extinct), know which birds’ nests the different cuckoos lay their eggs in, or are aware that New Zealand’s wrens have an interesting evolutionary history. Birdstories will help unravel these mysteries and brings to light some species which until know have been ‘best kept secrets’. Now I’m waiting eagerly for ‘Reptilestories’, ‘Mammalstories’ and ‘Invertebratestories’. I’d enjoy a similar treatment of the tuatara and our lizards, or short-tailed bat and giant snail, for example. For those whose curiosity is similarly picqued, I’d recommend Ghosts of Gondwana by George Gibbs as their follow-on read.